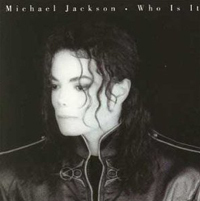 "Who Is It" is a song by American recording artist Michael Jackson. It was released by Epic Records on August 31, 1992 in the UK, and March 29, 1993 in the US, as the fifth single from Jackson's eighth studio album, Dangerous (1991). The song was written and composed by Jackson, and produced by Jackson and Bill Bottrell. The song's lyrics pertain to despair over being left by someone you love; some critics noted a comparison to the lyrics of the song to Jackson's single, "Billie Jean", from the album Thriller. As part of the promotion for the song, two music videos were released in 1992. The song was not performed by Jackson on any of his world concert tours. He did, however, perform a small segment of the song in his interview with Oprah Winfrey in early 1993. An instrumental portion of the song was supposed to be used during the This Is It comeback concerts in London, which were canceled due to Jackson's death. "Who Is It" was recorded by Michael Jackson in 1990 for his eighth studio album, Dangerous, which was released the following year. Jackson wrote and composed the track, and produced it with Bill Bottrell. It was released as the fifth single from Dangerous on August 31, 1992 in the UK, and March 29, 1993 in the US, by Jackson's record label, Epic Records. The lyrics of the song tell of a man who is left in despair when his lover suddenly leaves him. He learns that she was unfaithful to him and wants to know with whom she cheated. Several music critics compared "Who Is It" to Jackson's 1983 single "Billie Jean". Jon Pareles, a writer for The New York Times, described "Who Is It" as an "imitation" of "Billie Jean". Chris Willman of the Los Angeles Times claimed that the track "recaptures some of the slinky, insinuating feel of 'Billie Jean.'" Jonathan Bernstein, a writer for Spin, wrote that "Who Is It" was "close skin to "Billie Jean". Alan Light of Rolling Stone noted that unlike his previous efforts, it is about betrayal. "Who Is It" was commercially successful worldwide, generally peaking within the top 30 positions on national music charts. The song peaked at number 14 on the United States' Billboard Hot 100 chart, while peaking at number six on Billboard Hot R&B/Hip-Hop Songs, as well as topping the Billboard Hot Dance Club Play. Internationally, "Who Is It" reached the top 20 in several countries. The song debuted on the United Kingdom music chart at number 12 on July 25, 1992, and the following week reached its peak position, number 10. It remained within the top 100 positions for seven consecutive weeks from July to September 1992. In France, the track peaked at number eight on August 29. "Who Is It" reached its lowest peak position at number 34 in Australia. In Austria, the track debuted at its peak position, number five; the song remained within the top 30 chart positions from August to October. "Who Is It" debuted in Switzerland on August 2, at number 40, and peaked at number 14 two weeks later. The song debuted at number 94 in the Netherlands, and the following week moved up 60 positions, eventually peaking at number 13. In Sweden, the track entered the country's music chart at its peak position, number 24 and, after four weeks, fell out of the top 50. In Norway, the track debuted at its peak position, number 10 on the 30th week of 1992; the song charted at its peak position for two weeks before falling off the chart. The song also peaked at number 16 in New Zealand. After Jackson's death in June 2009, his music experienced a surge in popularity. "Who Is It" re-entered the Switzerland music charts for the first time in over 17 years, hitting number 49 on July 12, 2009. Directed by David Fincher, the music video for "Who Is It" was released in 1993. It begins with Jackson in what seems to be a hotel, singing about his girlfriend portrayed by English model Yasmin Le Bon. He is distressed because he found a silver card in with the name "Alex" on it. It implies that his girlfriend is cheating on him with someone else. As the story in the video unfolds, the girl takes on different identities (i.e. Eve, Diana, etc.) for her job as a high class call girl. "Alex" (which is also a girl's name), just happens to be one of them. The video alternates scenes from where Jackson is singing about his pain, to where the girl is being changed into her different identities and taking care of her jobs (mostly meeting with other men and even some women and sleeping with them). Towards the end of the video, Jackson has packed up his bags to leave town, because of his distress. A helicopter comes to pick him up from his house. The girl comes to Jackson's house and she asks his assistant (who knows the situation and aided Jackson in his departure) to let her in. It is likely she quit the job for him and wants to stay. The assistant shakes his head, implying that he left. When she asks why, he drops a flutter of silver nameplates (including the one that said "Alex") from a slot in the door. After that scene, Jackson is seen sleeping and smoke floats out the side of the screen. Having lost her love and without any alternative, the girl turns to her callgirl existence again. Her employer slaps her in the face and she is then seen being prepared for a new identity. This version did not initially air in the USA but was included on the video albums: Dangerous: The Short Films and Michael Jackson's Vision. Another version of the video features footage from past music videos and live performances. This is the version that first aired in the USA. ^ Golding, Shenequa (March 15, 2016). "Watch As Michael Jackson Leaves Oprah Winfrey Mesmerized with His Beatbox". Vibe. Retrieved July 25, 2018. ^ a b c Dangerous (Media notes). Epic Records. 1991. ^ Pareles, Jon (November 24, 1991). "RECORDINGS VIEW; Michael Jackson in the Electronic Wilderness". The New York Times. p. 2. Retrieved October 23, 2014. ^ Willman, Chris (November 24, 1991). "Michael Jackson's 'Dangerous'". Los Angeles Times. Retrieved October 23, 2014. ^ "Michael Jackson – Dangerous – Epic". Spin. 7 (11): 66. February 1992. ISSN 0006-2510. ^ Light, Alan (January 1, 1992). "Michael Jackson – Dangerous". Archived from the original on May 8, 2013. .
^ a b c d e f g "Dangerous – Awards". AllMusic. All Media Network. Retrieved October 23, 2014. ^ "Official Singles Chart Top 75: 19 July 1992 – 25 July 1992". Official Charts Company. Retrieved October 23, 2014. ^ a b "Official Singles Chart Top 100". Official Charts Company. Retrieved October 23, 2014. ^ "Michael Jackson". Official Charts Company. Retrieved October 23, 2014. ^ a b "Lescharts.com – Michael Jackson – Who Is It" (in French). Les classement single. Retrieved October 23, 2014. ^ a b "Australian-charts.com – Michael Jackson – Who Is It". ARIA Top 50 Singles. Retrieved October 23, 2014. ^ a b "Austriancharts.at – Michael Jackson – Who Is It" (in German). Ö3 Austria Top 40. Retrieved October 23, 2014. ^ a b c "Swisscharts.com – Michael Jackson – Who Is It". Swiss Singles Chart. Retrieved October 23, 2014. ^ a b "Dutchcharts.nl – Michael Jackson – Who Is It" (in Dutch). Single Top 100. Retrieved October 23, 2014. ^ a b "Swedishcharts.com – Michael Jackson – Who Is It". Singles Top 100. Retrieved October 23, 2014. ^ a b "Norwegiancharts.com – Michael Jackson – Who Is It". VG-lista. Retrieved October 23, 2014. ^ a b "Charts.nz – Michael Jackson – Who Is It". Top 40 Singles. Retrieved October 23, 2014. ^ Bruno, Antony (July 2, 2009). "Michael Jackson Music Sales Surge Could Last For Months". Billboard. Retrieved February 27, 2010. ^ Halstead 2007, p. 358. ^ a b c d e f g h "Ultratop.be – Michael Jackson – Who Is It" (in Dutch). Ultratop 50. Retrieved October 23, 2014. ^ "Top RPM Singles: Issue 1713." RPM. Library and Archives Canada. Retrieved October 23, 2014. ^ "Top RPM Dance/Urban: Issue 0983." RPM. Library and Archives Canada. Retrieved September 24, 2018. ^ "Offiziellecharts.de – Michael Jackson – Who Is It". GfK Entertainment Charts. Retrieved March 19, 2019. ^ "The Irish Charts – Search Results – Who Is It". Irish Singles Chart. Retrieved October 23, 2014. ^ a b "I singoli più venduti del 1992" (in Italian). Hit Parade Italia. Creative Commons. Retrieved October 23, 2014. ^ "Nederlandse Top 40 – Michael Jackson - Who Is It" (in Dutch). Dutch Top 40. Retrieved October 23, 2014. ^ "CASH BOX Top 100 Singles – Week ending MAY 22, 1993". Archived from the original on October 10, 2012. . Cash Box. ^ "Swisscharts.com – Michael Jackson – Who Is It". Swiss Singles Chart. Retrieved October 23, 2014. ^ "Jaaroverzichten 1992" (in Dutch). Ultratop. Hung Medien. Retrieved October 23, 2014. ^ "Jahrescharts – 1992". Offiziellecharts.de (in German). GfK Entertainment Charts. Archived from the original on May 9, 2015. ^ "The RPM Top 100 Hit Tracks of 1993". RPM. Vol. 58 no. 23. Library and Archives Canada. December 18, 1993. Retrieved October 1, 2018. This page was last edited on 24 March 2019, at 21:26 (UTC).